Some people have monitor lizards (I use to have one, too). 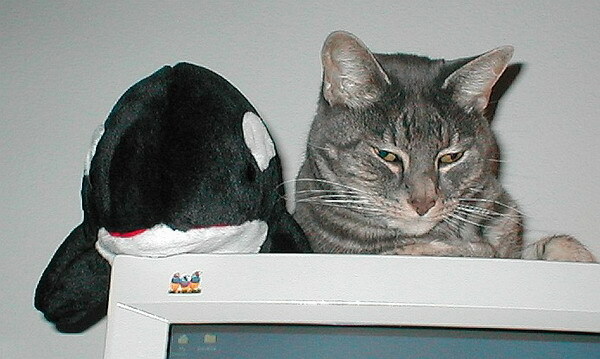 I've also had monitor crabs, monitor whales, and, of course, a monitor cat. Atticus loved the warmth of CRT tubes. I suspect he'd hate my modern flat panel if he was still around. Update: This picture made it into the Friday Ark. There is one trackback on this entry. There is one comment on this entry. What a cutie he was! I think all cats are attracted to the monitor. As much for warmth as the fact that we sit in front of them all day. I used to have one that was the same way. Great blog, love the pictures!